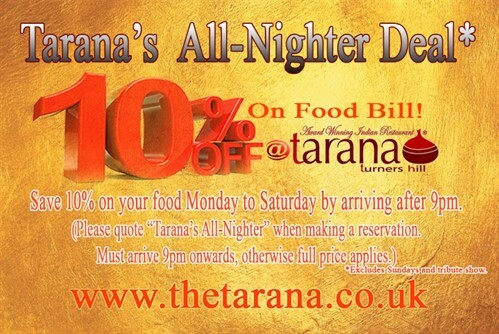 We are excited to introduce our new special offers for customers dining at tarana Turners Hill off-peak times. Check out the details below and book your table today! Take advantage of Tarana’s Happy Meal offer by arriving between 5.30 & 6pm! Monday to Saturday get 10% off your total bill. *Excludes Sundays and tribute show.